I feel like I am in my groove. I have had a string of quilts to do for clients recently that just strike accord with my aesthetic perfectly. Quilting them is like making music - easy and almost effortless. I do the harder ones too, and they usually look great when done. Ones like this quilt are easy to start and hard to pull myself from when other motherly duties call. This is made by my California client Robyn. Her daughter got married last year. It's a wedding gift. The wall-hanging is a mere 36"square or so, and has signature fabric on the backside that her guests signed. How personal is this?! The bride and groom also reside in one of my favorite cities, San Francisco. Ever since living in northern CA in the 1990's while in grad school, I have had a love of California. Yes, wild poppies are everywhere, and yes, Napa (pre-fires) is very lovely and romantic. But San Francisco has something for everyone. It is needle-turn appliqued, as many of Robyn's quilts are. I used 2 layers of batting, cotton/poly and wool, both by Hobbs.This gives great definition to the appliques. I knew it would receive sufficiently dense quilting so the 2 layers of batting don't appear too puffy. As usual, there are an assortment of threads. SID is done with Madiera Monolon. The outer border (all tan) is quilted with Superior Magnifico. I pulled an orange YLI polished poly for the poppies and a blue of some variety for the water. I use many threads...whatever color is needed drives which thread will be used. As for the bobbin threads, usually I only quilt with Superior SuperBobs, but I have a few 80wt bobbins by Wonderfil I am trying to use up.Small projects like this are perfect because I don't run any risk of not having enough. Plus, this thread is super-fine, and it did not obstruct the words on the signature blocks. 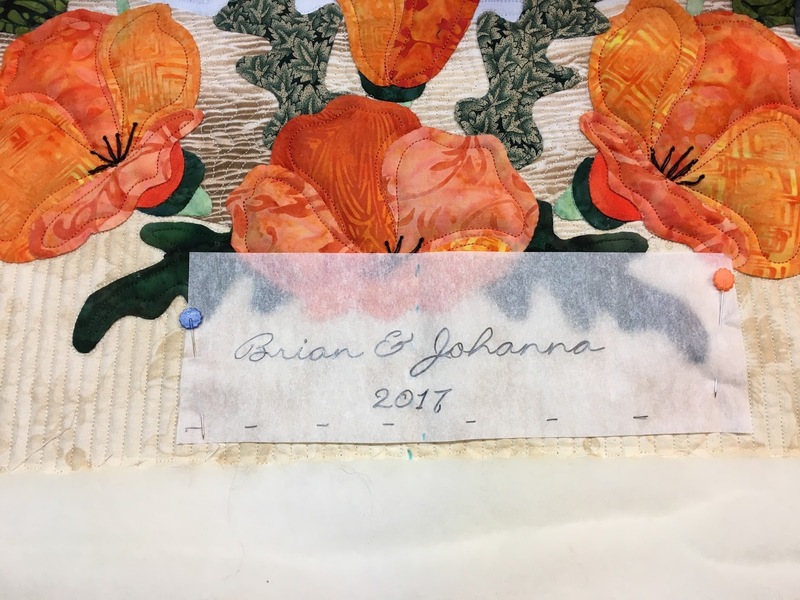 I added the date and bride-groom names on the longarm. I printed them out at a good size on paper, then traced it onto tracing paper. It was pinned onto the quilt top so that it would remain straight and centered. I then stitched right through the paper, going over the letters 3 times to create an almost embroidered look. The paper all but falls off when done. This was a bit of an experimental method that seemed to work flawlessly! The lettering was quilted after and over the parallel lines. There is considerable quilting on the tops of the appliques. This gives them added detailing and texturing. Some stitching is simple, like the poppies. The birds received a good bit more with feathers, lines and clam shells. Here are the grape clusters. These leaves had veins added. Here's a peek at the back. The signature fabric was a tad too small, but the additions will only show on the sides once a hanging sleeve is added. This is such a great idea for how to use this type fabric...not just for labeling quilts! Hope you enjoyed this quilt. There is another of this client's applique quilts on my frame right now. This quilt was finished about a week ago, and will be flying its way home to CA tomorrow. My client and maker reports this as having been started many years ago. She designed the embroidery blocks herself and then they were colored with several colors of crayon. 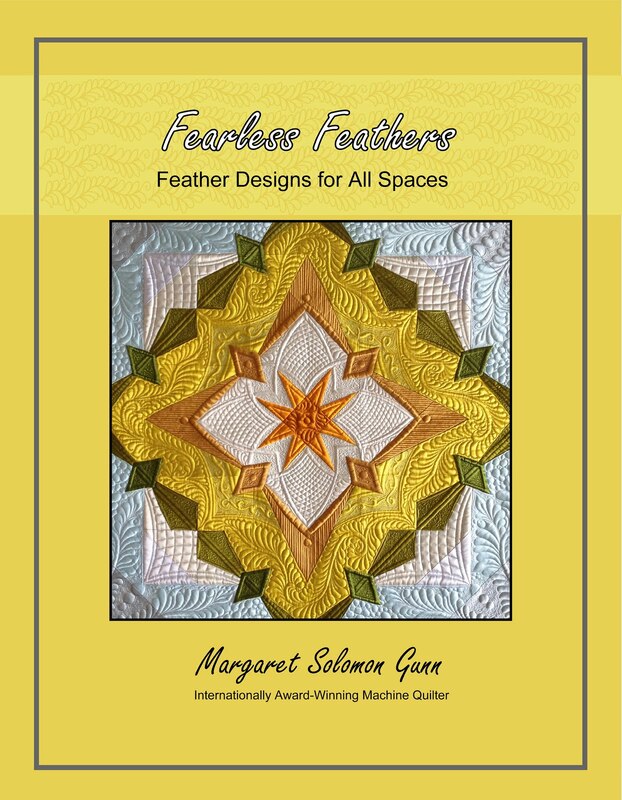 It was a joy to work on because the ideas for the quilting just flowed so easily. First off, she wanted me to put something pretty in all of the blank white space. That part is easy. The outer border has one of my favorites, curved crosshatching. It is combined with some feathers and linear work for visual interest. This quilt has a single layer of Hobbs 80/20 so it is soft and drapable. I used a 40 wt thread in a soft brassy tan for the outer border and the framework of the setting squares. The subtle color helps these designs to show more. The stipple fill and leaf fillers were quilted using a matching off-white 50wt So Fine thread. I wanted them to sink in and only show as texture. At the end, I came in with clear nylon and outline stitched the roses and leaves to give the shapes a finished look. This last step is worth the time, although many do choose not to do it. The setting triangles have a scalloping frame that is created with a template. This comes in a bunch of sizes and is rather pricey for templates, but I own one and love the shape it creates. Inside the frame is a smaller version of the stencil shape that was put in the squares. That is a good tip. When buying a particular stencil, purchase the same thing in 2 or 3 sizes so that similar shapes can be quilted on the same quilt to bring cohesion. I also "embellished" the base stencil design by adding additional leafy petal echoes and pebbles at the center. Stencils are nice, but often they don't provide as much detail to the quilting that I like. The fill around the roses is very textural. It is more interesting than the stippling used in other places too. I also found that the leaf fill coordinated with the leaf shape of the stencil, by pure chance though. It's a beautiful and old-fashioned looking quilt that my client will cherish. Aren't solid backings just wonderful??! The lighting is not ideal for a great full shot. Never fear, though, I have a couple hundred closer-ups to reasonably show all of my blunders. I double batted this with Hobbs 80/20 wool-cotton blend and a layer of Hobbs wool on the top. This maximizes the loft and definition from the designs. My initial plan was to use a combination of 40wt and 100wt threads, but when I actually got to it, I only used 40wt. It's too much trouble to switch to the 16 needle each time I want to run the finer thread. Using the heavier thread just meant I had to be neat on the backtracking because all deviations would show. I often get questions while teaching about my process for quilting. In other words, where do I begin and what is quilted first. The unsatisfying answer is that it varies from quilt to quilt. On this one, however, I opted to baste the entire top first. I run 1/2" basting stitches in rows about 5" apart, creating a grid. This enables me to start wherever I think it makes most sense, and change out thread colors as needed. I chose to begin at the center and work my way outward. Each petal was first outlined, and framed, as shown below. Only after the entire flower was "SID" did I remove the basting threads and start filling each of the petals. As you can see, I played around a bit. Though the making of class and book samples is sort of serious business (I do want my business to convey the best of my abilities), this is also a time when I believe it is important to relax, let down my crazy need to perfectionista every stitch, and JUST HAVE FUN. There are different width and style frames for different petals. Experimentation can be rejuvenation. The fills I used mostly come from one of my two fills books -- Dense and Dainty or Beautiful Backgrounds. They are all "freehand" (ie, no computer), but a few of them use the assist of a grid. Some of these patterns never made their way onto an actual quilt, and some of them never made it into the book at all. I had to draw a limit somewhere. OK, there is also one silly feathered petal on the flower. I just had to do it. 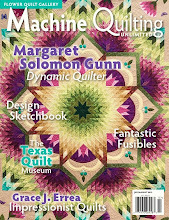 If anybody asked me what I thought of modern quilting, I would likely try to run the other way. Most days it makes me feel like a deer caught in the headlight of an oncoming train. Modern and Me just are not comfortably synonymous. Once I get past the notion though that I am quilting designs that convey as modern, it is much easier, and it really is fun. I think part of my mental break with the modern movement is that I don't love that many of the quilts themselves, but I do relate with the heavily graphic quilting. That is what made this quilt so perfect for my mentality. It is a beautiful non-modern flower that I could quilt modern designs in moderation all over. Clearly, some are full-out traditional. The juxtaposition of combining both styles on one quilt makes my job exciting. Anybody curious how long this little quilt took to stitch? Would you cry at a ripe 14 hours? I was a bit surprised because I was sure it would be a one day job. I should know by now that I am usually off by a factor of two on my own quilts! Bamboo and chicken wire (albeit a tad wonky). Gears for the engineer. Maybe a braid or two or five. My center is a little wonky. I need to not be so literal in how I interpret where the petals are located. It's like a yummy box of candies - one of everything. Basketweave, a spiderweb, tiny hearts and a few bricks. I love that top center petal. 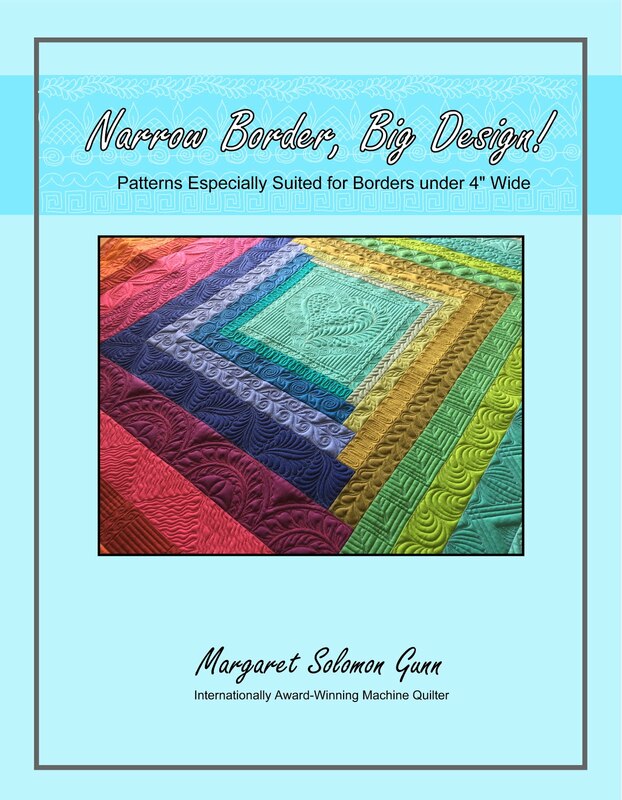 This pattern is so stinking easy to quilt but has the coolest 3-dimensional appearance. The quilting is done with yellow for the center, two shades of peach/orange and 2 shades of pink. All thread is either Superior Magnifico, Glide or YLI polished poly. I tried to switch threads to best blend with the color of the petal. Some of the larger petals have more color variation, so the thread shows more. Did I mark things on this?...You betcha. I mark with a air erasable pen whenever it is helpful. My eye is decent (the matchstick lines above are eye-balled), but not perfect. The tiers of the bricks are neatly marked so I don't look like a drunk mason quilted them. My current marking pens of choice - Leonis, and I order them from Amazon. They work WAY better than the other purple or blue pens you can buy at a quilt shop. Don't let their small length deceive you. Here is a fun grid pattern I do on a square grid, this time stitched in a hex grid. Grid designs are cool that way. 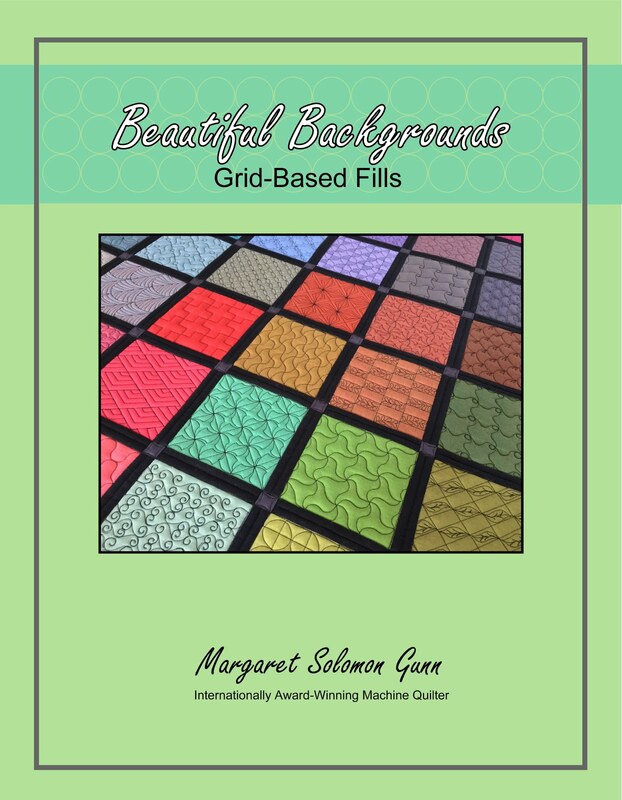 Many can be quilted on different style grids to create a completely different look. Last picture...Yup, I used ugly old muslin on the backside. It would not have been my first choice for sure, but (if you can believe this) I just did not have a single piece of anything (besides my silk Radiance stash) that did not require lots of piecing. Sigh... So, anybody who sees this in person can inspect my raunchy backtracking with ease! Quilt on...and if you have quilted one of these, please leave me a link so I can be further inspired! This week I quilted Lori Holt's Bee Happy quilt for a local client. It is bright and colorful, and just screaming for spring! This quilt is 72"x80" and has a ton of appliqued elements. While not every quilt needs to receive over-the-top custom quilting, I have a really hard time simply putting an edge-to-edge across designs like this, even when the client's budget may lean more towards that type of quilting. I knew that the budget was aggressive, but my goal was to optimize what she had hand appliqued to the best of my ability. The quilt has just a single Hobbs 80/20 batt. Though wool would be my batting of choice for any applique quilt, the cotton is perfect for those everyday, high-use quilts. It is also a cost-conscience choice that many quilters make. In the end, how it is quilted will determine how much loft the appliques get too. I chose a workhorse thread - white Superior Magnifico. This 40wt thread is one of three like this (YLI polished poly and Filtec's Glide are the other two) that I routinely use. What color I ultimately need determines which thread is used usually. This thread runs beautifully and rarely causes issues -- a plus when excess time to fuss with picky threads is not in the budget. Additionally, it gives the quilt a subtle sheen. Anybody who follows my blog for very long knows I don't often stipple. I can't say I am a huge fan of it, nor do I find it overly attractive. 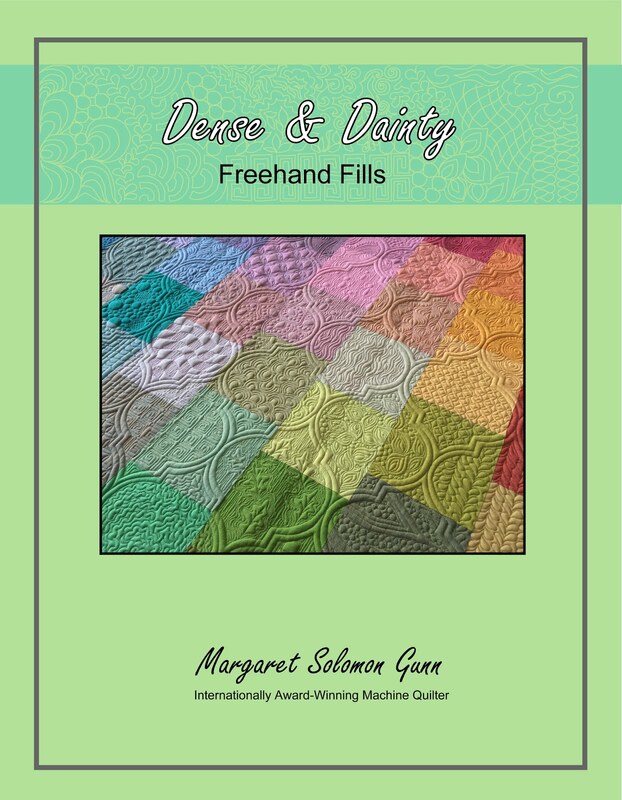 I teach a class and wrote a book (Dense & Dainty) all about freehand fills that could be used largely in place of stippling. What I will say is that stippling has its place. Many of the fills in the book are time-consuming because they are denser. The other driving force on this quilt is that all of the background fabrics have a print that will greatly obscure whatever pattern the background is quilted with. I weight that factor considerably when choosing a fill to stitch. If you go to the time to quilt it, it ought to show. Stippling enables decent "flattening" of the background, which in turn allows the appliques to pop. Some of the other areas on the quilt such as the churn dash and pinwheel blocks were quilted differently so that they show off. This just gives the top variety. It also allows the simple linear quilting of the sashing and outer border to show more. Both of these relatively simple linear treatments provide nice variety, and are actually time efficient to quilt too. I like them. By going simple on the background for the reasons I described, I was left with enough time to ensure that all appliques were appropriately ditch quilted. This gives each applique clean definition, which I feel is important on this type quilt. I also added some detail quilting (using clear thread) on areas like the chicken wings, center hexagons, and other appliques upon appliques. I should note one last thing. This particular quilt has numerous embellishments, mostly buttons of differing sizes. If you are making the quilt and will send it to a quilter, wait and attach the buttons after it is quilted. They make it hard for the quilter to get the hopping foot close in some areas. I also inadvertently knocked off a button too. This is risky because it could have damaged the fabric. I was lucky in that it will only require reattaching the button. This is just my simple two cents advice from actually quilting several quilts with buttons. The quilt made it home to it's owner yesterday, and she was delighted with the result. That always makes me happy! I have been busy all week on a quilt I am not sure I am allowed to share yet, so I have decided to talk about the process of making a quilt with an 11-yr old. Recently, Machine Quilting Unlimited magazine published an article I wrote about quilting with kids -- most specifically it discusses my experiences of quilting with my kids. In 1250 words, though it is challenging to really talk about what works and what does not work. Here on my blog, though, I not limited by space. This is my daughter Sophie's 2017 quilt. When originally asked for a name to give it, she declined, saying she was bad at that, and I should just name it. It was near the entry deadline, and it just needed to be entered. It will hang next month among the kid quilts at MQX, a show she has entered 4 other times. For the entry I named it Bahama Beach Huts. You see, it came from a pattern (below) for beach cabanas, though we turned the door piecing right-side up because this just seemed odd. When she started the quilting, Sophie realized they did not resemble beach huts since she chose green instead of sand, and changed the name. So this pattern came out of a Fons & Porter Fat Quarter Quilts magazine I picked up for her friend. 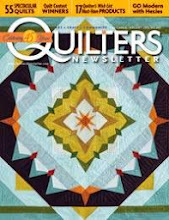 Long story short...we gave her the magazine with a precut version of this same quilt for her birthday in December. She has taken a basic sewing class, and has a sewing machine, and wanted to make a mini-quilt. Feeling envious, Sophie doubled the fabric allotments and decided she'd make the same quilt herself. This was a good decision. Hook, line and sinker...I had her on the hook now to make her MQX quilt. At the end of December, the girls got together for a day to piece the blocks. Here's the beach hut block sweat shop in my dining room. For the most part it was smooth sailing. Neither probably would have gotten as far as they did if the other was not there. Sewing as a team is a good motivator. I brought up my sissy ironing board (not the "real" one that is 30"x 6'), and both did their own pressing. In past years, Sophie has not ironed. Call me over-protective, but rotary blades and irons just seem dangerous to young kids! Not this year. When Lillian said she'd ironed, it was fair game. My only request was that the starch be sprayed away from the wall. That seemed like a reasonable request. Here they are...lots of little hut blocks in the making. Nothing like the 11-yr old hammy model to show us what she's made. The finished top is a mere 30"x36". It is really a perfect size for a youth quilter. Twice as large may seem more functional, but making a functioning quilt was not the point. Having an educational experience that has a manageable start and end was. The one thing I know is that overwhelming the child, regardless how interested they seem initially, will only make them disinterested. The weekend before I went to MAQF, we endeavored to quilt this. It really was about as late as it could have been pushed, since it is being shipped to MQX in a week. One of the biggest challenges of quilting with kids is that they don't typically quilt regularly. Every year when we make a quilt it seems like there is a memory game of trying to recollect what was learned the past year. 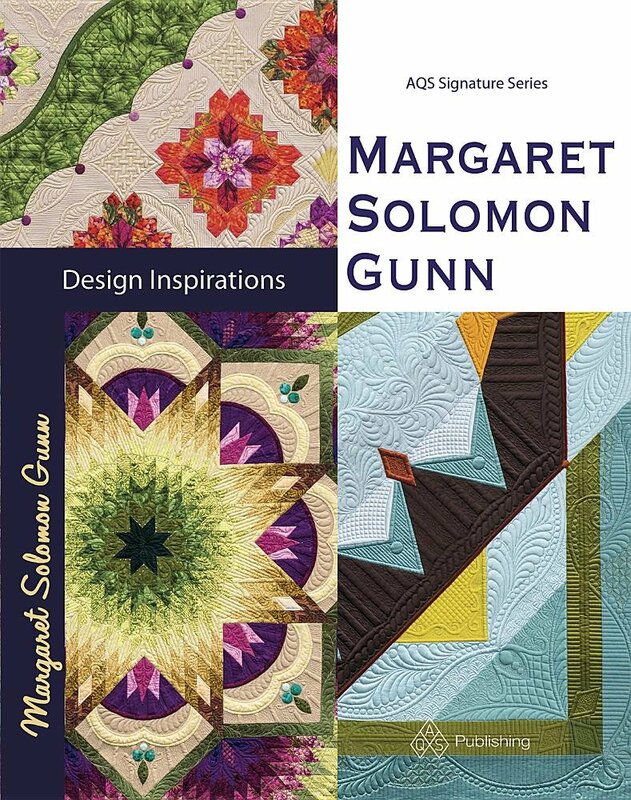 I do try to bring new motifs and techniques to her project each year so as to broaden her horizon and further educate her about quilting. But really, she just cannot longarm weekly, so we have to do our best. I envisioned her possibly playing with a freehand grid-based design over the houses initially. The longarm was loaded with a sample house block as well as a yard or so of cheap fabric on which to play. As it turned out, the wiggly grid was inconsistent and harder for her than I anticipated. Probably should have marked it on a straight grid, but when the child does not like it, move on. Lesson learned. She played with some freehand ideas, some of which I marked partially and then she freehanded. These were motifs that could go on the block - like wind and clouds. For whatever reason, loops are still hard this year too! I have to give it to her, though, she has vision. She said she wanted to do bricks for the house. A couple of big red flags went off with this request - first, these might be the only brick beach huts I have ever seen (hence the quilt name change! ), and second, Oh my...my very beginner 11-yr old quilter wants to quilt bricks. BRICKS. She is stumbling with loops and wiggly lines, but is asking about bricks. Not being one to discourage her, I marked off some bricks (above) and away she went. Surprisingly, they were not as bad as I expected. Brick houses they would be! This meant she had a LOT of marking to do, but it was necessary because crooked tiers of bricks would not look very good. Might as well mark the clouds while you are at it. It was a weekend adventure. I simply clear my client schedule for a few days so that I don't need to rush her. We take the quilting in small manageable bites of 45-90 minutes at a time. Of course, bribing her with the remainder of my xmas candy canes afforded a little more time! Use the tools you have, I always believe! Though she is getting taller, the kitchen step stool is really a necessity. It puts her up where she can see everything. Disregard the "still in pajamas" "unbrushed hair" "I'm a careless 6th grader" look. There is no dress code in my studio. Now, let me show you her top after the quilting, then I'll talk about what was done in each area. Because this is our 6th quilt, she is able to do several different "stitches" or motifs. Not very many of the youth quilters approach their quilts with a custom quilted look. More are done using an edge to edge. There is absolutely nothing wrong with that; we did two of them like that previously including a twin-sized bed quilt. These little houses just called for something more, and she knew that. Using a light aqua YLI polished poly thread, the "wind" and clouds were quilted in the sky areas and across the roofs. She had to very carefully backtrack along the ditch of the block so that this could be quilted with minimal start and stops. She has learned to use the electronic channel locks, and used them to help her ditching lines stay straight. She picked a fun pink-purple variegated Aurifil poly thread for her bricks. I think she did an amazing job on this, considering how very much control this design really requires. Sure, there are places where the backtracking is not ideal, but hey, she's 11! Next, a bright green YLI thread was put on the machine to do the "grass"...zig-zag lines, the straight lines of the door and the "plants". Her greenery for the flowers got a little out of hand occasionally, but quilting with a child is a game of live-and-learn (not sew and rip out). The zigzags were freehanded to give texture. The doors were quilted with marked lines using the vertical channel locks. She was striving to create a semi-realistic look, and I think she succeeded. We had a plan to add flower buttons to the "greenery" and door knobs to the doors later on. After the binding was added, we went shopping for the "details". At first we bought sparkly flower buttons, but the shank on them was too large making them not lay flatly. Plan B was to create sparkly flowers from my extensive stash of crystals. Seriously, what pre-teen girl can't use one of these tools??! She was a natural. She created some tall flowers and some round ones. I kept using the "variety" word - in reference to shape and color. Yes I love orange, but not for all the flowers. Mix them up a little. We also bought some little "critter" plastic buttons. I hacked the shank off with a serrated knife, and they were glued to the quilt at the end. Here's a look at one of the houses, complete with all the details! I love it...great job. The owl is perfect, as he is rolling his eyes. Someday she will understand the irony of including him. Her favorite, no doubt, is the hedgehog. He may be a porcupine, but don't tell her! If you want to read more about our quilting adventures, here are links to her 2014 quilt, 2016 quilt (scroll down), and a general post. Making the sewing project a big craft project engages the child from the beginning. I still need to get together with her friend Lillian and help her finish her quilt too. Although we tend to time her sewing/quilting projects to get an entry into MQX, mostly that stems from her enjoyment of coming to the show with me and seeing her quilt hanging too. Since she was a wee little thing, barely 4 or 5, I took her with me to the shows. I hope she continues to enjoy this together time that sewing brings.